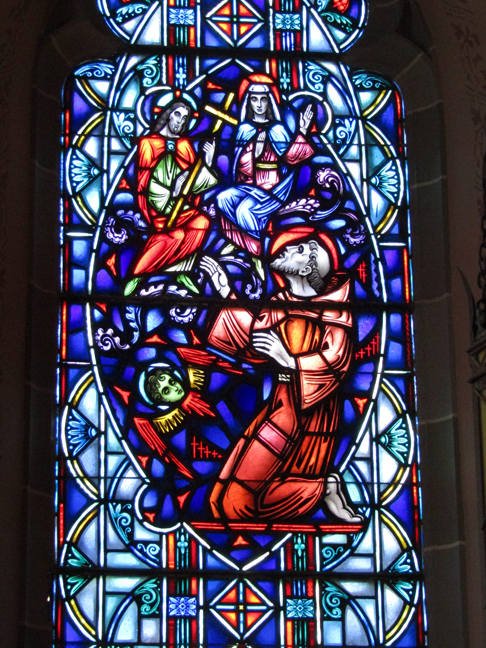 Brief Description of Subject: Window: The window is part of a pair of windows about St. Francis of Assisi that are located in a small room on the gospel side of the narthex. 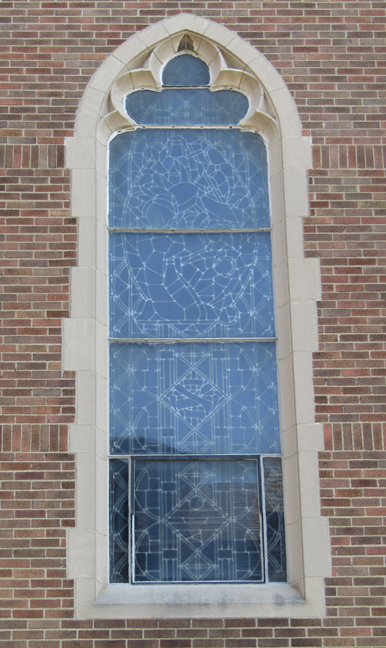 The room now serves as a small chapel; its altar obstructs the view of the bottom portion of this window. 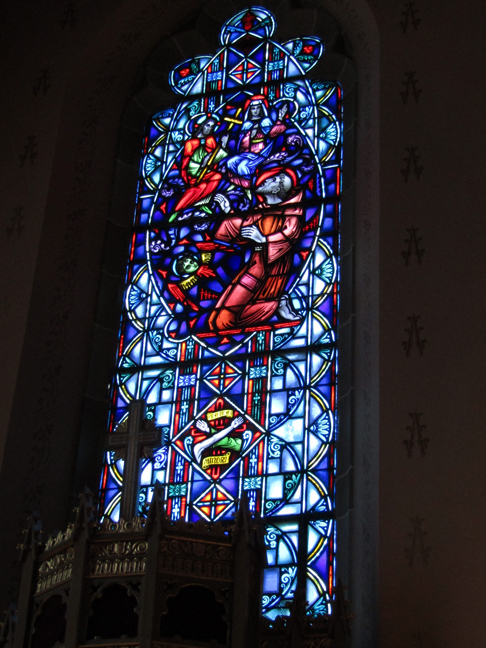 The window depicts the story of the "Portiuncula Indulgence". St. Francis was kneeling in prayer when he envisioned many people coming to the Portiuncula Chapel. Surrounded by angels, Jesus and Mary then appeared to him and asked him "What would you want to help poor sinners?". St. Francis replied "grant a plenary indulgence to all who visit Portiuncula and make a confession". Jesus and Mary agreed and it was granted by the Pope. 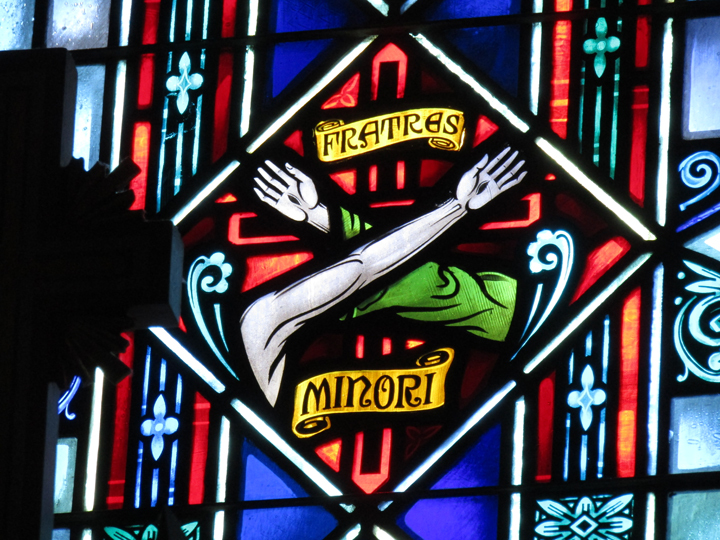 Below this scene is the inscription "Fratres Minori" over a cross and hands that contain the stigmata -- one is Christ's hand and the other St. Francis's hand. Background: St. Francis (1181 -1226) renounced all material possessions and was directed by Christ to repair a small abandoned Benedictine Chapel called St. Mary of the angels -- better known as Portiuncula (little portion). He lived in the chapel and was joined by many followers which in 1209 led him to found the "Order of Friars Minor" aka "Franciscans". In 1224 he received the stigmata from a crucified Christ in the form of an angel.